For the following models the USB charger adapter may not remain in or be inserted into the socket when the ignition is switched off or the ignition key is removed: all model year 2006 models and older as well as A1 (before product improvement 01/2015), A3 (2nd generation to 03/2013 and older), A4/A5 (B7 to 02/2009 and older), A6/A7 (C6 to 09/2011 and older), A8 (D3 to 07/2010 and older), Q7 (1st generation to 03/2015 and older), TT (2nd generation to 03/2014 and older). Not for mobile end units that use less than 5V/2.4A. High quality. 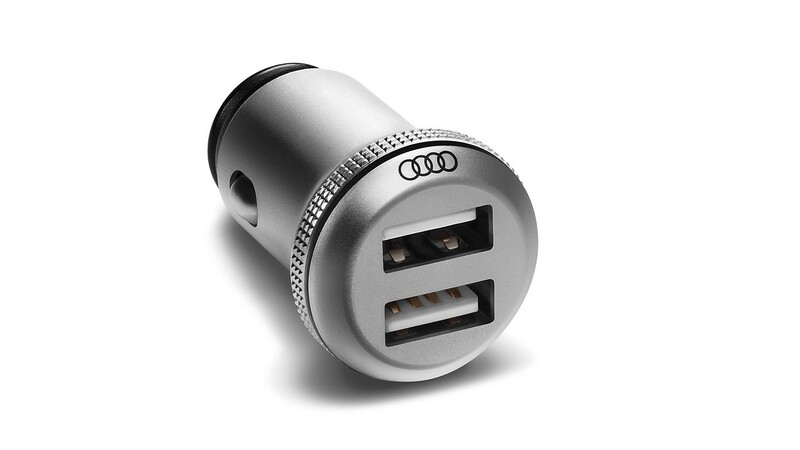 Compact Audi design in aluminium. Convenient. The simultaneous charging of two mobile end units is possible. Practical. Supplies connected end units with 5 V and max. 2.4 A. The high output recharges quickly.